SPACE SAVER: maximizes your closet space, can holds 5 pants on one. 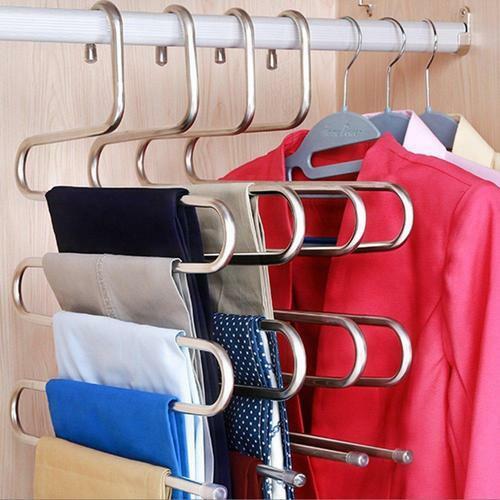 Conveniently hangs jeans, trousers, pants, towel, scarf, ties and more. Keep your clothes neat and colour cordinated. Weight-Bearing:Our new generation pay more attention to weight bearing, hangers can bear weight of 5 pants/trousers at the same time. Anti- scratch: Soft non-slip cap on hanger, protect clothes from scratching and eliminates creases. Established in the year 2010 at Mumbai(Maharasthra, India), we “THE IMMART” are engaged in Wholesaling, Importing, Trading, Suppling and Exporting of Home Product, Rechargeable Battery, Lamp Projector, Electrical Products, Grab Shopping Bag, Lunch Box And Bottle, etc. Our company is Partnership based company. Under the guidance of “Hardik Bansal” we have achieved reputed success. We Export and Import our products from world wide.